Mark Gertler (1896—1939) was born in Spitalfields in London’s East End, the youngest son of Jewish immigrant parents. When he was a year old, the family was forced by extreme poverty back to their native Galicia (Poland). His father travelled to America in search of work, but when this plan failed the family returned to London in 1896. As a boy he showed a marked talent for drawing, and on leaving school in 1906 he enrolled in art classes at Regent Street Polytechnic, which was the first institution in the UK to provide post-school education for working people. Once again, because of his family’s poverty, he was forced to drop out after only a year and take up work as an apprentice in a stained glass company. However, he continued with his interest in art, and after gaining third place in a competition he submitted his drawings to the Slade and was granted a scholarship by Sir William Rothenstein. His contemporaries during four years at the Slade included David Bomberg, Paul Nash, Edward Wadsworth, Christopher Nevinson and Stanley Spencer. 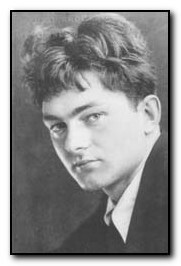 More fatefully for his private life, he also met and fell in love with Dora Carrington. They had a turbulent and anguished relationship which lasted a number of years. Meanwhile, he won prizes and scholarships, then left the Slade in 1912 to paint full time. He was patronised by Lady Ottoline Morrell who introduced him to Walter Sickert, Augustus John, and the Bloomsbury Group. He became moderately successful as a society portrait painter, but suffered in such company because of his relative poverty, his working-class origins, and his Jewishness. In 1914 he was also taken up by Edward Marsh an art collector who was later to become secretary to Winston Churchill. Even this relationship became difficult, since Gertler was a pacifist, and he disapproved of the system of patronage. 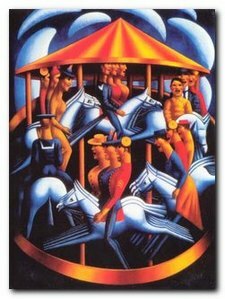 He broke off the relationship, and around this time painted what has become his most famous painting – The Merry-Go-Round. In 1915 he became the love object of Lytton Strachey, but he continued his own pursuit of Dora Carrington for five years before she finally agreed to have a sexual relationship with him. For a time, he shared her with Strachey, with whom Carrington had meanwhile fallen in love. When she eventually left him to set up home with Strachey, Gertler was crushed and mortified. As a young man, he projected a personal magnetism which fascinated many of his contemporaries. He is the model for the sinister sculptor Loerke in D.H. Lawrence’s novel Women in Love, the dashing Byronic hero of Aldous Huxley’s Chrome Yellow, and the egotistical painter of Katherine Mansfield’s story Je ne parle pas Francais. The first symptoms of tuberculosis appeared in 1920, and he was forced to enter a sanatorium. Nevertheless, despite his poor health, he continued to have yearly exhibitions at the Goupil Gallery in Regent Street. In 1930 Gertler married Marjorie Hodgkinson, and they had a son in 1932. Their marriage was often difficult, and Gertler suffered from the same feelings of ill-ease that undermined relationships with his patrons. Edward Marsh continued to buy Gertler’s paintings, even though he admitted that he no longer liked or understood them. But in order to supplement his intermittent income from painting, Gertler was forced to become a part-time teacher at the Westminster School of Art . Throughout the 1930s he had difficulty in selling his paintings, even though he had a few loyal supporters such as J.B. Priestly and Aldous Huxley. But depressed by what he saw as his own failure, his ill-health, and the fear of another imminent world war, he committed suicide in June 1939. He is buried in Willesden Jewish Cemetery. This biography of Mark Gertler reappraises an extraordinary artist. Gertler was admired and encouraged by Walter Sickert, Vanessa Bell, Roger Fry and Henry Moore. His magnificent and haunting pictures were keenly collected by London society and yet at 48, feeling alienated, he killed himself. Sarah MacDougall explores the life of this complex man, whose powerful images, like the “Merry-go-round” or the “Creation of Eve” have lost none of their disturbing eloquence. Annotated gallery of original first edition book jacket covers from the Hogarth Press, featuring designs by Vanessa Bell, Roger Fry, and others. A brief history of Roger Fry’s experimental Omega Workshops, which had a lasting influence on interior design in post First World War Britain. An essay on the largely pacifist and internationalist stance taken by Bloomsbury Group members towards the First World War. Mini web site featuring photos, paintings, a timeline, sub-sections on the Omega Workshops, Roger Fry, and Duncan Grant, and biographical notes. Exhibition of paintings, designs, and ceramics at Toronto University featuring Hogarth Press, Vanessa Bell, Dora Carrington, Quentin Bell, and Stephen Tomlin. Search the texts of all Woolf’s major works, and track down phrases, quotes, and even individual words in their original context. An annotated description of Clarissa Dalloway’s walk from Westminster to Regent’s Park, with historical updates and a bibliography. Annotated tour of literary and political homes in Bloomsbury, including Gordon Square, University College, Bedford Square, Doughty Street, and Tavistock Square. News of events, regular bulletins, study materials, publications, and related links. Largely the work of Virginia Woolf specialist Stuart N. Clarke. A charming sound recording of a BBC radio talk broadcast in 1937 – accompanied by a slideshow of photographs of Virginia Woolf. Leslie Stephens’ collection of family photographs which became known as the Mausoleum Book, collected at Smith College – Massachusetts. A collection of book jacket covers, Fry’s Twelve Woodcuts, Strachey’s ‘Elizabeth and Essex’.